specialized piano service to the Dallas - Ft. Worth area. We have been entrusted to relocate some of the most famous pianos in the world and have made a name for ourselves on those especially difficult upstairs moves. We also provide specialized storage because pianos are the only thing we store. For years now we have been developing new ways to recover pianos that have been in a fire or water related catastrophe. We also provide in home tuning and service. We are owned by a Registered Piano Technician with the Piano Technicians Guild. 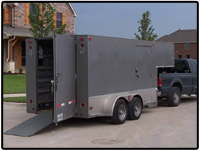 Cousins Piano Moving has been in the piano service business for over 20 years. The company is owned by Darren Speir who grew up in the piano business. He is a Registered Piano Technician in the Piano Technicians Guild, a worldwide organization that promotes the sharing of information and provides a means of certification for piano technicians. Darren had a full time job working on pianos since he was 15 and at age 20 started his own piano service business. 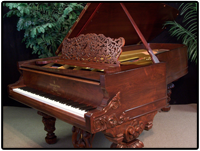 In 1990 he started Cousins Piano which emphasized professional moving and storage and quality restoration. As the staff began to grow so did the reputation for providing quality service for our clients. We now service all aspects of the piano business. Our philosophy has always been "Quality comes first"
When quality counts contact Cousins Piano.